Business owners in Mill Valley and throughout Marin know this better than anyone: one of the biggest challenges you face is hiring, driven largely by the lack of affordable housing and the long commutes for prospective employees. In an exciting partnership with the City of Mill Valley, we're co-hosting a Mill Valley Job Fair, the first MV-centric job fair in ages, at the MV Community Center (180 Camino Alto), with easy access and plenty of free parking. The event is Tuesday, April 23, 3:30-6:30pm. The 411: The Mill Valley Job Fair is Tuesday, April 23, 3:30-6:30pm, at the MV Community Center, 180 Camino Alto. Forum is set for Thursday, April 25, 6-8pm, at the MV Community Center, 180 Camino Alto. Citing the need to upgrade aging pipes and equipment and keep up with inflation, the Marin Municipal Water District is proposing a four-year rate increase starting in July as well as a new fee that would add another $163.50 or more to the average customer’s property tax bill each year. MMWD's board is set to vote on the rate and fee increases at its May 14 meeting, preceded by a public workshop on Thursday, April 25 at the Mill Valley Community Center (6-8pm). The board is expected to discuss the rate and fee hikes at its next meeting, set for March 19 at 7:30pm at its offices at 220 Nellen Ave., Corte Madera, CA 94925. Customers' additional annual fees, which will be levied on their property tax bill, will be determined by the size of their water meter, as district officials say a larger meter has the capacity for significantly higher water demand than a smaller meter. 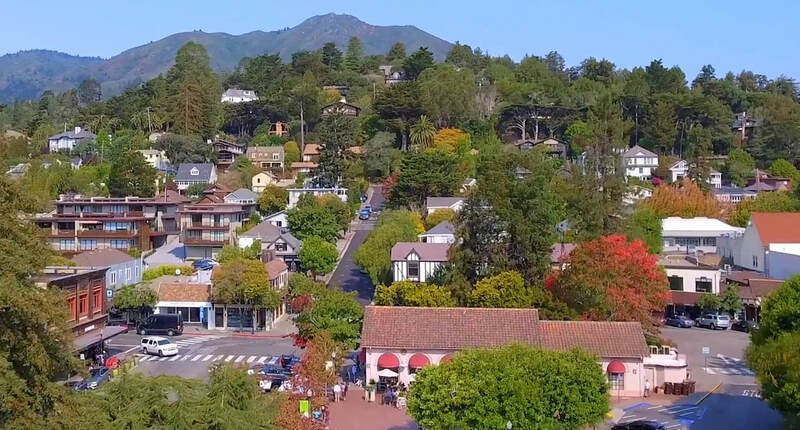 Most customers in Mill Valley a 5/8-inch meter and and thus will incur a first-year fee of $163.50 (which can be increased by the MMWD board by up to 4 percent each year after that). Fifty-two percent of non-residential (mostly businesses) in Mill Valley have a 5/8-inch meter, according to MMWD data, and another 23 percent have a 1-inch meter, for which those customers would pay a $409 fee in the first year. The district is planning at least $208 million in capital improvements in the next decade that would be paid for with the new fee revenue, according to the Marin IJ. The projects funded by the additional revenue include $18 million in seismic upgrades to its three water treatment plants, $27 million in maintaining and replacing storage tanks and $103 million to replace aging pipelines and pump stations, among other investments, according to district officials. About $1 million of fee revenue is proposed to go to fire fuel management and firefighting equipment. District officials told the Marin IJ that the fees are meant to "shift the district away from borrowing money to pay for infrastructure to a cash-based system instead," resulting "in lower interest payments being passed on to customers, ultimately saving each customer an estimated $90 per year." In addition to the new fees, the proposed water rate increases are meant to increase by about 4 percent annually to address costs of inflation. An 2017 IJ editorial pointed out the turbulence of water policy in recent years: "Ratepayers have been whipsawed by the (MMWD)’s mixed messages. While following the district’s push for conservation, by cutting back on their water use ratepayers have reduced the district’s income. That led to last year’s approval of a two-pronged increase that boosted rates 27 percent, including fees for water, service and managing the district’s watershed. Then complying with the state’s emergency order to reduce water use during the drought, the district came back with another round of increases. Ratepayers have been using less water, but paying more for each drop." Marin County Bicycle Coalition reps take residents on a tour of the then-new Miller Avenue Streetscape in 2017. The Mill Valley City Council is set to make a final decision on March 4 on how best to configure a section of Miller Avenue, and it's got plenty to consider: parking, safety, emergency access and a quintet of possible choices. 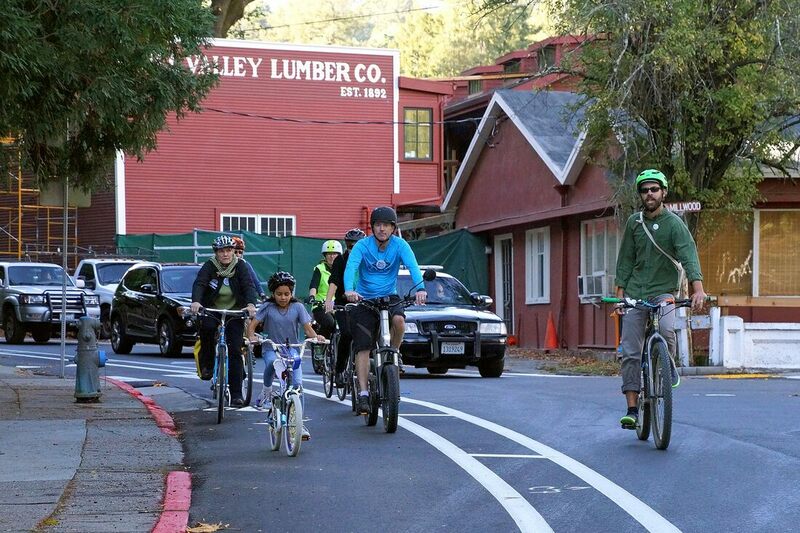 At the conclusion of the 18-month Miller Avenue Streetscape Project in 2017, the City Council decided to create a pilot project around how best to configure the roadway's Parkway section between Millwood and Willow streets, the area between the Mill Valley Lumber Yard and Mill Valley Music and Critterland Pets. While the Miller Avenue Streetscape Plan, which the Council adopted in 2011, called for two car lanes in each direction through the Parkway, the segment was re-striped to one lane on each side during construction to allow for additional parking in the area. That decision was driven by the significant impact on available parking during construction, and the extra space on the road for bicyclists with one less lane for cars. The one lane pilot project provided 65 parking spaces in the Parkway, counterbalancing the overall loss of 65 parking spaces on Miller as part of the Streetscape project. In weighing all of the options, City staff is giving the Council five choices for the Parkway configuration, ranging from turning the road back to two lanes in each direction and completely eliminating parking on both sides to keep it exactly as is. Staff's recommendation seeks to split the difference, maintaining one lane of travel on each side but eliminating all of the outbound parking – 37 spaces – gained in the pilot setup. The City's environmental analysis has determined that there are no significant impacts associated with the one lane configuration, and its transportation study concluded that, for daily use of Miller Avenue, the one lane configuration has not negatively impacted traffic congestion, safety, travel speeds or cut-through traffic. The City public safety officials have advised that the one lane roadway configuration accommodates emergency and potential evacuation operations, and that the one lane configuration is wide enough to accommodate two streams of traffic in the same direction. The city's study of parking within the Parkway section concluded that parking in that section is occupied 82 percent during the day and the outbound curbside spaces that would be removed by the recommended option are occupied 73 percent during that time. The Mill Valley Chamber of Commerce Board of Directors weighed in on the issue, encouraging the Council to maintain the existing configuration for a variety of reasons, including the potential unintended consequence of driving employee parking into the local neighborhoods and discouraging consumers from coming to lower Miller Avenue and downtown. "Additionally, we encourage you to consider restricting most of the 37 outbound spots to those with Employee Parking stickers, whose owners we can track if necessary," The Chamber noted in its letter to the Council. "We note that at this time neither the former funeral home/childcare center on Miller nor the restaurant at the Mill Valley Lumber Yard are open. The 411: For more info on this issue, read the staff report here. Send your comments to cityclerk@cityofmillvalley.org. Despite ongoing North Bay concerns around issues like workforce housing and long commute concerns, and unhelpful “federal zaniness,” Marin County’s economic outlook looks healthy through 2020. That’s the word from Dr. Robert Eyler, professor of economics at Sonoma State University and the Marin Economic Forum’s chief economist. Eyler was among the speakers at an MEF event that centered on “Workforce Challenges and the Future of Work,” drawing more than 300 local business leaders to the Embassy Suites Hotel in San Rafael. Eyler acknowledged that global and national themes, from trade wars and the UK’s Brexit from the European Union to the recent government shutdown and the fight over building a wall across a portion of the southwestern U.S. border, impact Marin and the North Bay from a macroeconomic standpoint. But with a solid labor market – Marin’s unemployment rate is at a whopping 2.2 percent – the local impact of a recession won’t likely make its way here until 2021, Eyler said. That said, the continued impact of fires in Northern California and throughout the state, as well as the seemingly ubiquitous struggle to create workforce housing and reduce commute times, remain the biggest blow the regional economy must sustain, according to Eyler. Hiring, from hospitality and food service to life sciences, medical technicians and web developers, remains Marin’s biggest challenge because of the aforementioned housing issues, he added. Eyler was joined on the dais by a number of people at the forefront of the effort to train and attract the future workforce of the North Bay. “Those communities that figure out the talent pipeline are those that will win and the take the next step forward,” said Bruce Wilson, the executive director of the Workforce Alliance of the North Bay. Elizabeth Pratt, the dean of the career and technical education and economic workforce development at the College of Marin, said a broad cross section of businesses and institutions are focused on stocking that pipeline. “Workforce development is not a social service – it is a service to economic development,” Eyler added. Craig Nelson, board chair of the eponymous hiring and staffing giant, encouraged companies to combat the tight hiring market through a variety of strategies, from improving their employer brands on sites like Glassdoor.com and creating internal referral programs to providing flexible work schedules as needed and, of course, paying competitive wages. The 411: MORE INFO on the Marin Economic Forum. NOTE: Speaking of the hiring crunch, the MV Chamber and the City of Mill Valley are co-hosting a Mill Valley Job Fair on Tuesday, April 23, 3:30-6:30pm at the MV Community Center, 180 Camino Alto. Interested in participating as an employer? Email us here. 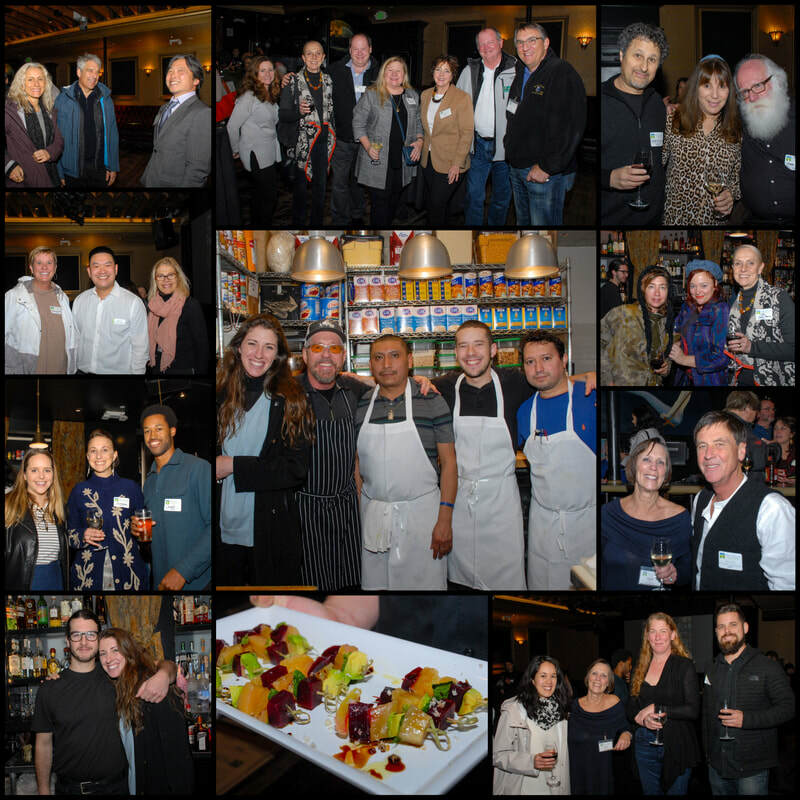 Inaugural Enjoy Mill Valley After Hours @ Sweetwater WAs a Soiree Before the Storm! 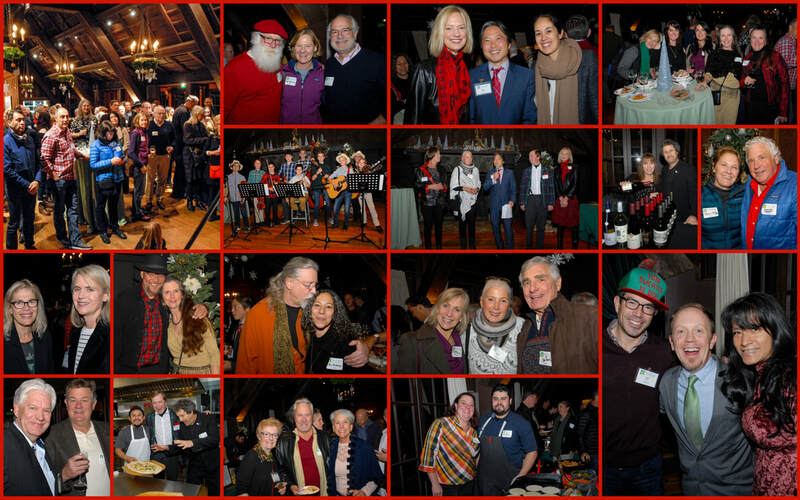 It was a tale of two evenings: On Wednesday, Jan. 16, inside the Sweetwater Music Hall, dozens of Mill Valley Chamber members and friends gathered for the debut of EMV After Hours in one of Mill Valley's most gorgeous spaces to catch up after the holidays, talk about the exciting year ahead, meet some friends and potential colleagues and celebrate the vital institution that is the Sweetwater. Delicious food was eaten, tasty beverages were consumed, fantastic raffle prizes were doled out and laughter abounded. Once it ended, however, attendees were reminded of the colossal storm we'd forgotten about as we enjoyed this fine evening. As we walked out into the night, the swirling rain and howling winds that had sent trees crashing to the ground all over town, much of which was without power, got our attention. Thanks to all of you who came out despite the weather, and most importantly, to Madison Flach, Gordon Drysdale and their excellent team for hosting such a fantastic event!! 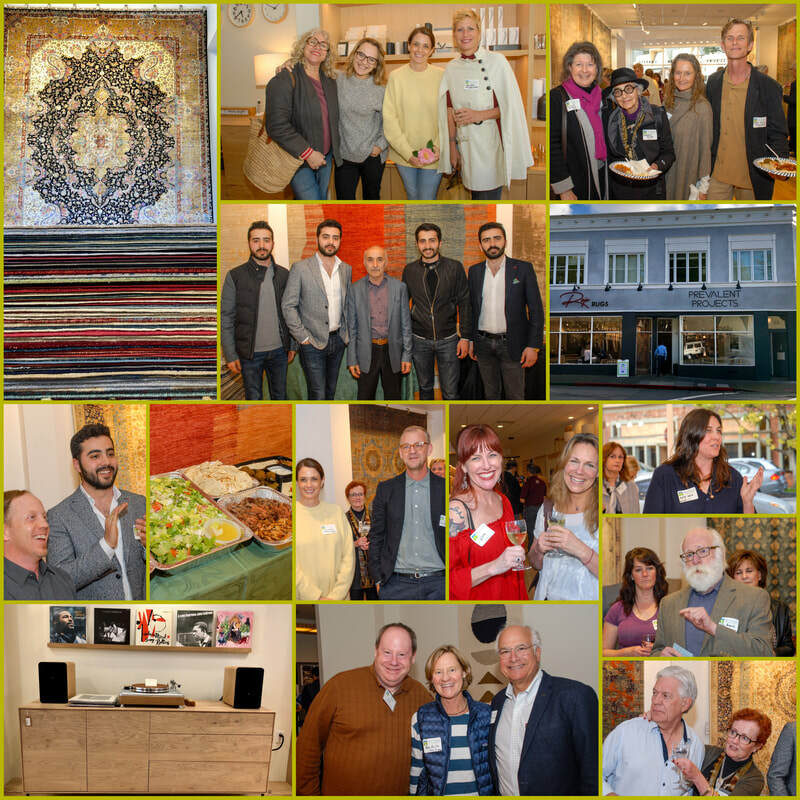 CHECK OUT GARY FERBER'S PHOTOS OF THE EVENING HERE! Noticed the bright pink and blue markings all over the roadways in downtown Mill Valley? They're a harbinger of big infrastructure upgrades to come over the next two years. 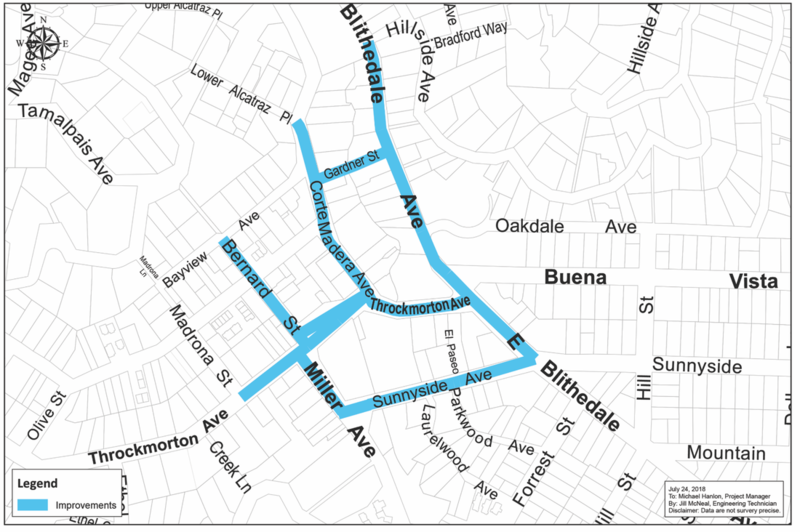 The City of Mill Valley currently has $4.3 million dedicated to upgrading sewer systems, sidewalks, roads, and utility infrastructure downtown, an area that spans part of East Blithedale and West Blithedale avenues, Corte Madera Avenue, Throckmorton Avenue, Sunnyside Avenue, Bernard Street, and Miller Avenue. The multi-colored markings on the sidewalks and streets are part of an effort to develop the base map for the downtown project, providing proper elevation of the streets, sidewalks and other features, according to project engineer Michael Hanlon. Poster told the Council that so many of the downtown features – streets, sidewalks, crosswalks – varied significantly in terms of height, thus making an effort to bring them all in line with one another both necessary but also complex. The project also calls for safety, bicycle-pedestrian improvements and accessibility upgrades that could range from a shortening of long crosswalks at intersections like Miller Ave. at Throckmorton Ave. up to a "potential reconfiguration" of downtown streets, particularly around Lytton Square, according to City officials. "The first part is fixing the sewer throughout the area," Public Works Director Andrew Poster told the City Council late last year in a meeting at which the Council agreed to pay consulting firm Harris & Associates more than $700,000 to do an in-depth study of the sewer system downtown. That survey is expected to run through April 2019, with construction tentatively beginning in May and running through March 2020. "It's really a paving project to start. And then the next phase is about gathering all of these larger ideas and see what we can stomach," Poster added. "Change is hard. There are tons of things we can throw out there, but is change desired? Is it needed?" The much-needed improvements will be weighed against issues of major concern to downtown business owners and shoppers, particularly the potential loss of parking and day-to-day disruption to businesses," he said. "There's no getting around it," Poster said. "This is going to be difficult on the businesses and on the folks that want to use these shops." With that in mind, City officials stressed that there will extensive public outreach in advance of the project, with the Chamber "getting a seat at the table from day one," said Councilman John McCauley. The construction period for any downtown "reconfiguration" would likely occur in 2021-2022, Poster added. "It's great that we're taking this holistic look at the downtown," Mayor Stephanie Moulton-Peters said. Downtown businesses and residents: Please send your contact information (name, email & address) for updates on meetings and project news. Email Linn Walsh at lwalsh@cityofmillvalley.org. Please stay tuned to learn more about how you can participate. A law passed in 2014 to help achieve California’s aggressive recycling and greenhouse gas emission goals moves into its next phase of implementation on January 1, 2019. In October 2014, Governor Jerry Brown signed AB 1826 Chesbro, requiring businesses to compost their organic (biodegradable) waste on and after April 1, 2016, depending on the amount of waste they generate per week. Organic waste is food waste, green waste, landscape and pruning waste, nonhazardous wood waste, and food-soiled paper waste that is mixed in with food waste. The law phases in the mandatory recycling of commercial organics over time, and therefore an increasingly greater proportion of the commercial sector has been required to comply in each year since its passage. Beginning January 1, 2019, all commercial businesses and public entities that generate 4-cubic yards of trash per week must recycle their organic waste to comply with new mandatory commercial organics recycling established under California Assembly Bill 1826 (AB 1826). These new state regulations apply to schools, stores, restaurants, businesses, and for-profit or nonprofit organizations located in California. New regulations also require multifamily properties with 5 or more units to have green waste service. Separating organic waste from other waste as part of trash collection. (See Mill Valley Refuse Service website link for organic waste collection services). Recycling organic waste on site, or self-haul organic waste off site for recycling. Subscribing to an organic waste recycling service that may include mixed waste processing that specifically recycles organic waste. (See Zero Waste website link below). The City of Mill Valley is working to educate our local businesses on new state regulations, and will be visiting local businesses in the New Year to provide assistance. Contact Danielle Staude, Senior Planner at dstaude@cityofmillvalley.org for more info. The City of Mill Valley has reduced its Greenhouse Gas emissions associated with waste generation by 26% since 2005. The new organics composting regulations will also work toward the City’s Zero Waste goal, wherein all materials are recycled, reused or repurposed. You can learn more about commercial organics programs through Zero Waste Marin and Mill Valley Refuse Service's website. While traffic, parking and construction tend to be the subjects of much of the input the City of Mill Valley gets from the community, 5G – the latest generation of telecommunications infrastructure that promises faster mobile phone and streaming video service – has suddenly elbowed its weigh into the inboxes of City Councilmembers and City staff in recent weeks. The ordinance would require the provider to apply for a Conditional Use Permit that will be reviewed by the Planning Commission for any new wireless facility and the Zoning Administrator “for smaller amendments to existing Conditional Use Permits.” It also requires annual EMF readings to determine that the wireless facility is within compliance of federal and state laws. Wireless telecommunications within the right of way in commercial areas must be 1,500 feet apart, according to the ordinance, and approval will be granted based on development standards, design guidelines, findings and conditions of approval established in the new ordinance. The Council directed staff to bring back a more comprehensive ordinance on the issue by mid-2019. Mill Valley’s ability to regulate 5G deployment was already limited. Under the Telecommunications Act of 1996, local decisions premised directly or indirectly on the environmental effects of radio frequency emissions are pre-empted by federal and state laws as long as the infrastructure complies with Federal Communications Commission regulations; certain modifications to existing wireless telecommunications facilities; and the installation of wireless telecommunications facilities on existing utility poles in the public rights of way, among other restrictions. On top of that, the FCC’s four commissioners unanimously voted to require cities to quickly approve or deny wireless carriers’ requests to deploy 5G cell installations, constraining the time cities have to review deployment requests, while also limiting them from taking into account issues like whether the installation will take place at a historical landmark. In addition to Mill Valley, San Anselmo and Ross have adopted similar ordinances, and Fairfax’s Planning Commission considers the issue on Oct. 18. The Marin County Board of Supervisors discussed the subject at its Sept. 20th meeting and agreed to form a subcommittee to study it further. Speak up: If you’d like to weigh in on this issue, send an email to Danielle Staude, a senior city planner, at dstaude@cityofmillvalley.org.